It’d been at the top of my ‘to try’ list for a long time. 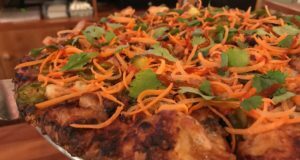 Two recent acclamations bestowed upon the Carroll Garden pizzeria significantly heightened my expectations of the joint. In May, Alan Richman from GQ Magazine ranked Lucali’s plain pie as the 2nd best pizza in the entire country (the best is in Chicago). Not that GQ is some renowned pizza publication, but you have to assume after eating 386 pizzas at 109 pizzerias that Richman would have some perspective on what a good pizza should taste like. 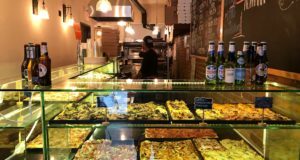 And in a move that surprised even myself, Zagat recently crowned Lucali the best pizza place in New York dethroning longtime champ Di Fara. 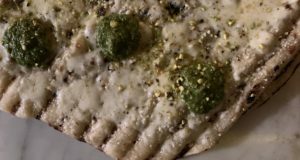 As anyone who regularly reads this blog knows, Di Fara is my absolute favorite pizza place and I can confidently say that Dom DeMaco’s pies are the best thing I’ve ever eaten. So how could I not sit down at Lucali with incredibly high expectations? 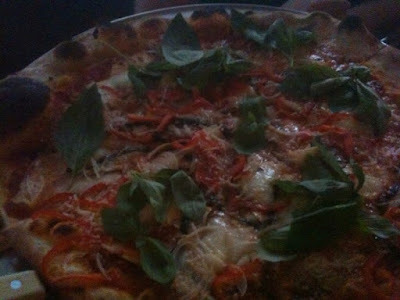 Pizza Club visited Lucali on a Sunday evening in early August. We arrived more than a hour before the pizzeria opened at 6PM (okay, I’d thought it opened at 5PM), but it’s a good thing our party of nine arrived so early. By 5:45, crowds had congregated outside, and I’d have to imagine that a party our size would have had to wait for hours if we’d shown up later. But the line was expected. Many Yelp reviews touch on the fact that the wait can be unbearable: We were told at 7PM tonight to expect a 1 hour wait. 2 1/2 hours later we gave up, writes one Yelper. We sat down at a long table by the window just after 6PM and put in our orders for three large pies (1) plain (2) pepperoni (3) mushrooms, peppers, and onions. 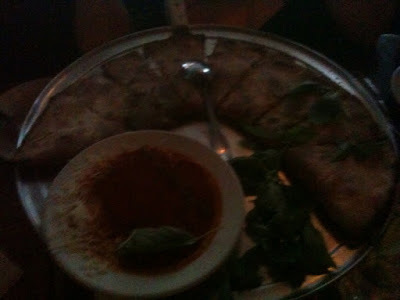 We also ordered two large calzones — one plain and one with artichokes. The pies are priced at $24 each with toppings costing $3 each. This makes it easy for a single pie with three toppings to run you about $40 after tax and tip. That breaks down to $5.00 a slice. 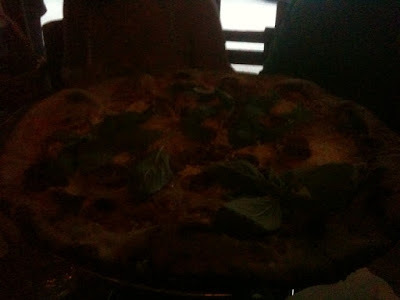 A tad pricey, but what I like is that Lucali makes large pies. Three to four slices are more than enough to fill you up. That being said, it’s hard to spend more than $20.00 per person (each of us spent $18.00). I’m not a fan of how nearly every upscale pizza joint across the city to open recently (Co, Keste, San Marazno) plunks down an puny personal pie in front of you for $15-$18 that leaves you wanting more. Or maybe that’s the idea. But the nine of us definitely left Lucali full… with a doggy bag in hand. The pizza itself was solid. Definitely not the second best pizza in the country or nearly as good as Di Fara, but it was tasty. 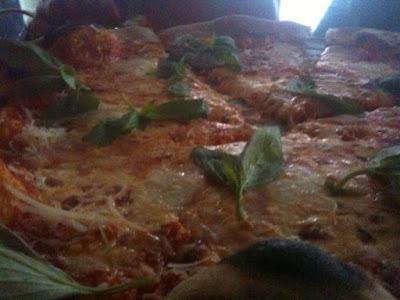 Pizza Club members gave it an average rating of 8.4 — not quite as good as Di Fara, but significant better than Co (7.7). Would I go back there? Undecided. If I’m going to trek out to Brooklyn and wait in line for a couple of hours I’m of course going to go to Di Fara (do I sound like a broken record yet? 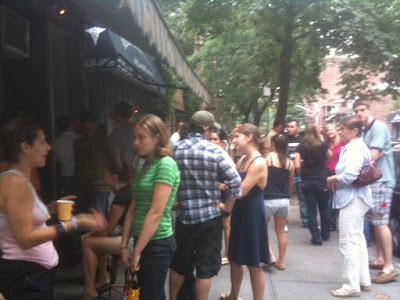 ), but if I was in the neighborhood and thought I’d be able to avoid the lines, I don’t see why I wouldn’t return. Decent pizza at a decent price… if you take it easy on the toppings, that is.